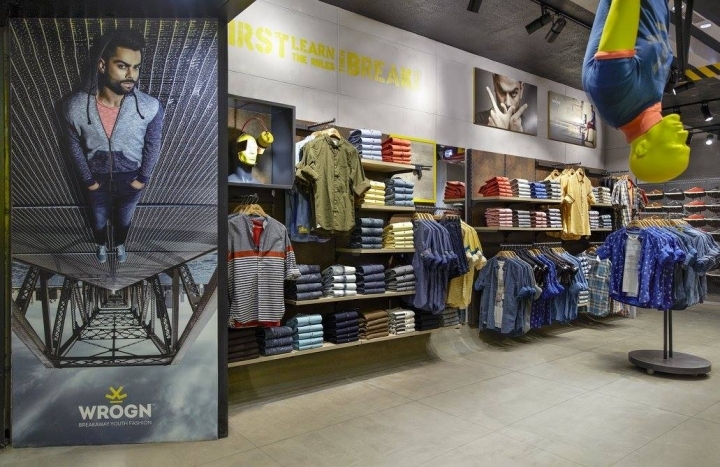 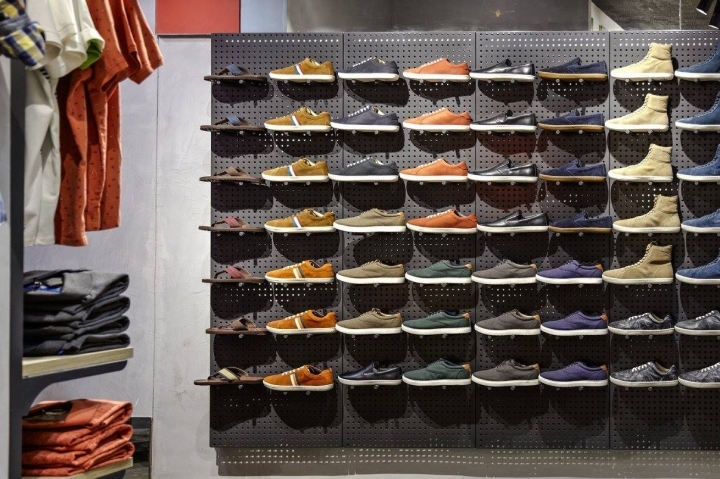 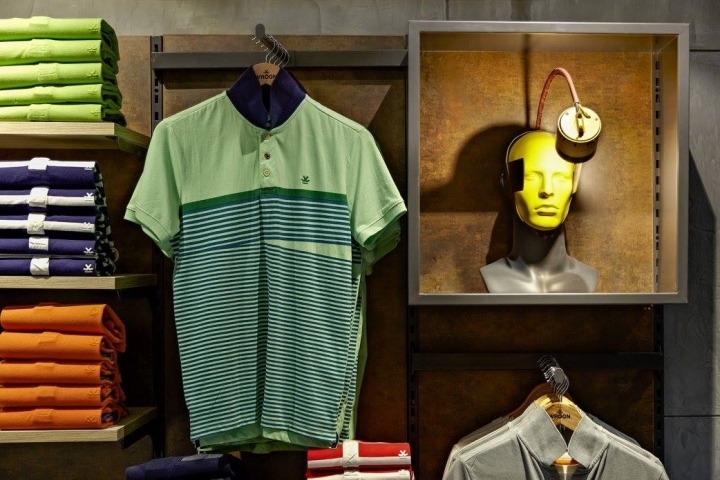 Two years into its existence, after confirming commercial success online and through a shop-in-shop format, men’s apparel brand Wrogn (Bangalore, India) has made its entrance into permanent brick-and-mortar stores with two new shopping mall locations in Mumbai and Hyderabad, India. 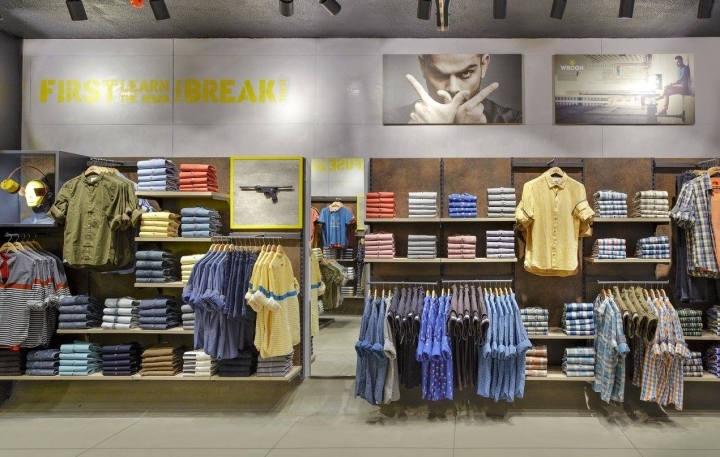 Appealing to contemporary, fashion-forward young men, the brand represents fearlessness, being unafraid to break the rules – carried over in the spelling of its name – and espouses a “question everything” philosophy. 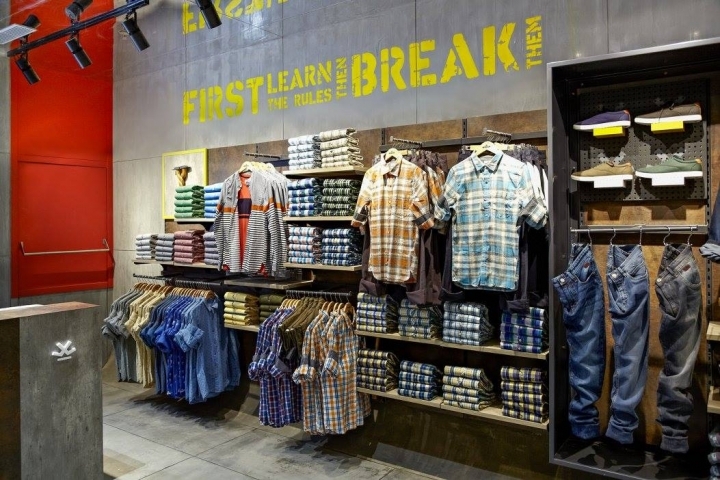 “The tagline for the brand is ‘breakaway youth fashion,’ and we strive to do things differently ... 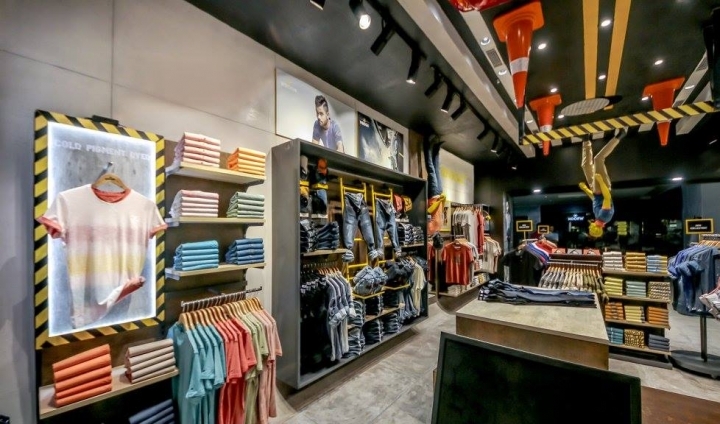 In doing so, [we] disrupt the youth fashion segment,” says Anjana Reddy, ceo, Universal Sportbiz Pvt. 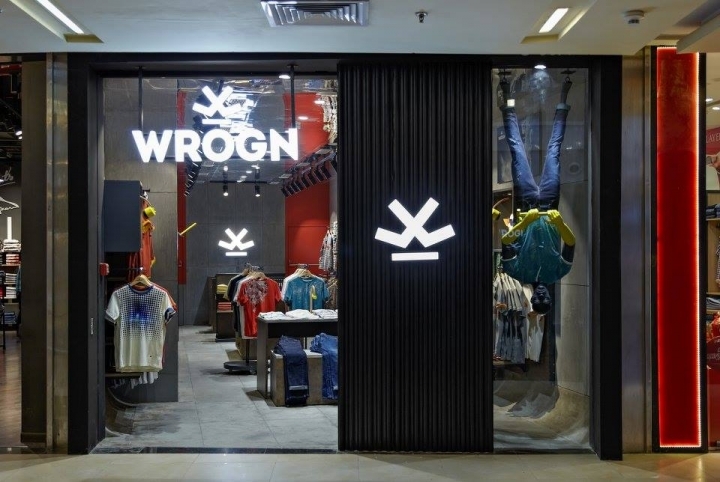 Ltd. (Bengaluru, India), Wrogn’s parent company. 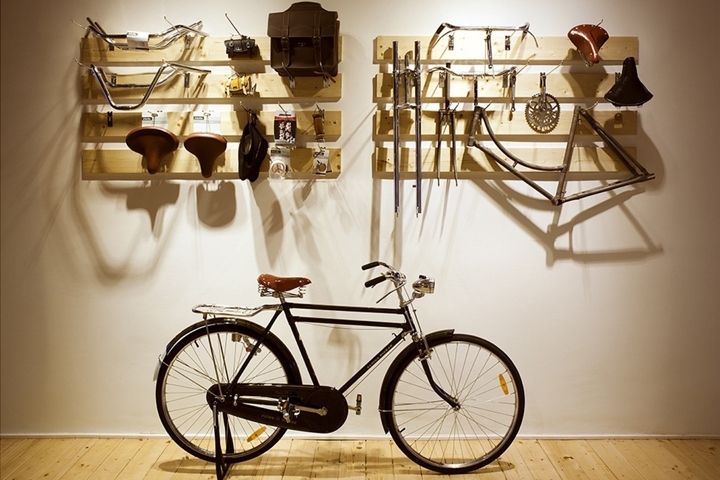 Charged with bringing its unorthodox vision to life, Restore Design Pvt. 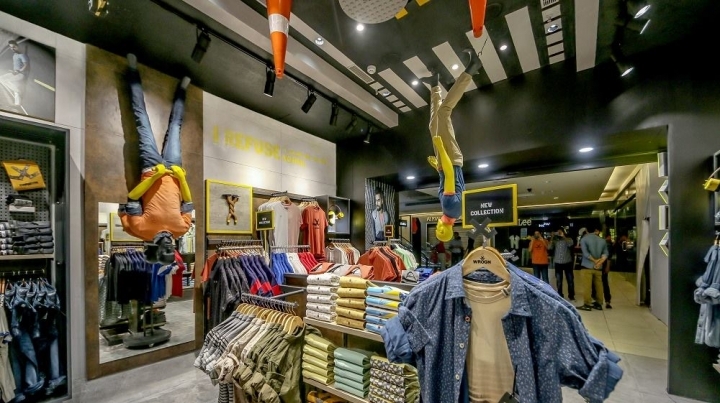 Ltd. (Bangalore, India) evoked the same sentiment in its stores, employing an upside-down, urban aesthetic, peppered with unexpected visual surprises. 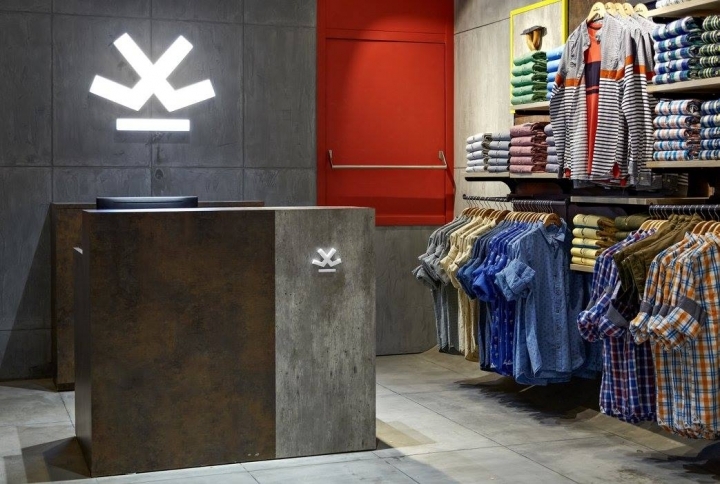 To emphasize a gritty, industrial vibe, designers specified raw materials like corten steel, concrete and wood, which lent durability, as well as rustic-look laminate to fit the project budgets. 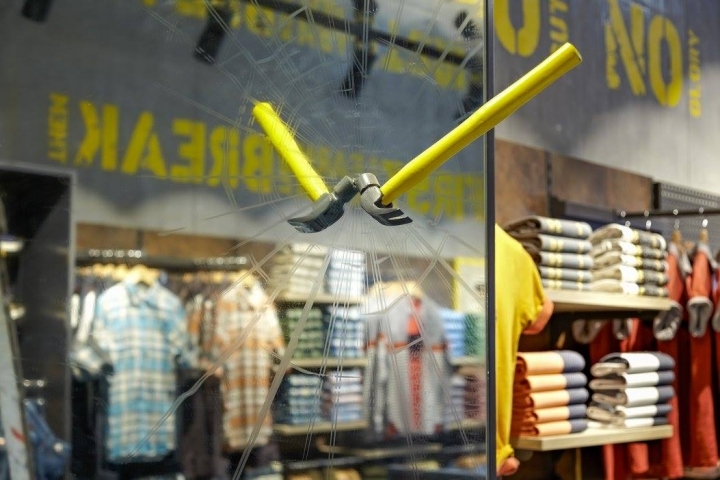 Accented features in bright yellow (at times mimicking caution tape) and red pop against the neutral backdrops and further convey an almost post-apocalyptic feel. 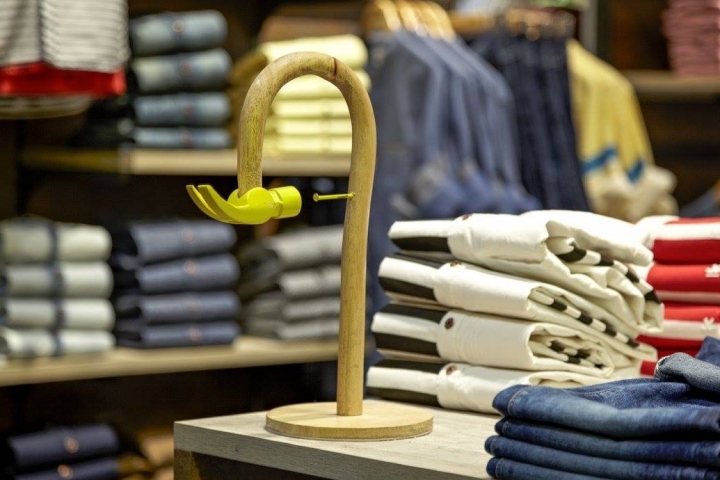 “The design carries the brand’s uncompromising attitude forward, featuring conventional objects as props that assume unconventional functions, orientations and purposes,” says Paolo Chiorino, lead designer, Restore Design. 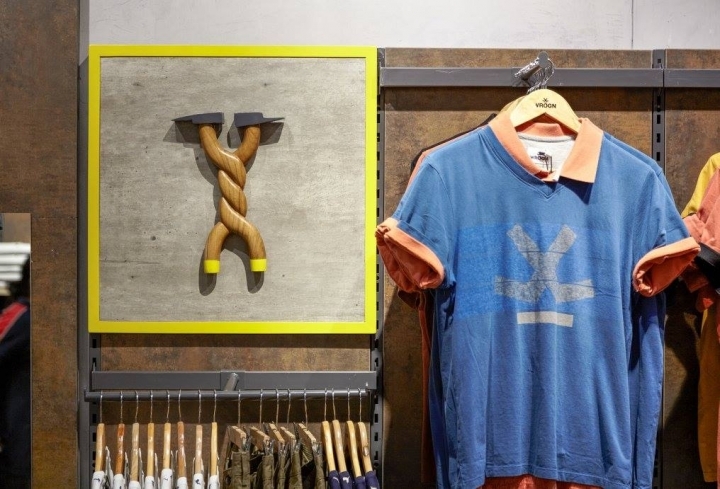 In conceptualizing and executing its offbeat, custom-fabricated props, Restore worked closely with its vendor to ensure they were a perfect fit for the stores, crafting mockups with an in-house sculptor to guarantee correct proportions and placement. 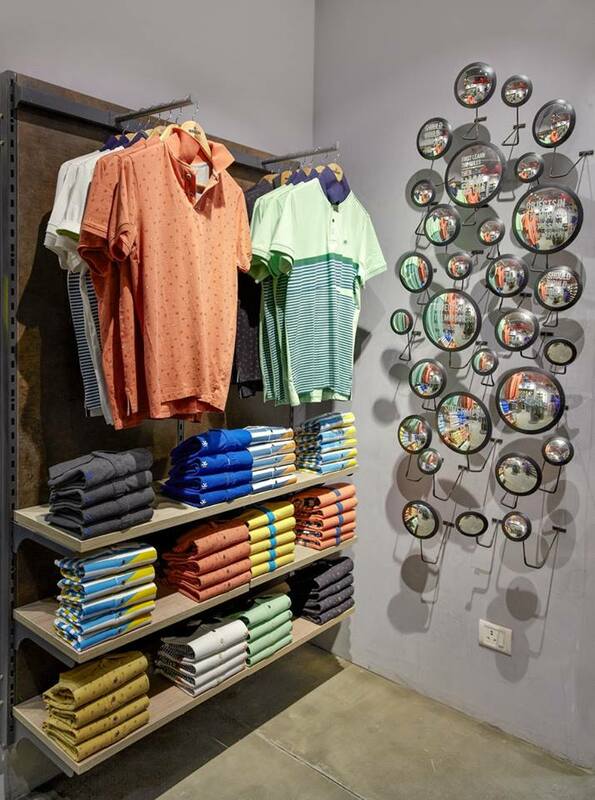 While most of the items were manufactured specifically for the stores, the Hyderabad store includes an actual restored black ’70s-era Opel Kadett car mounted to the ceiling. 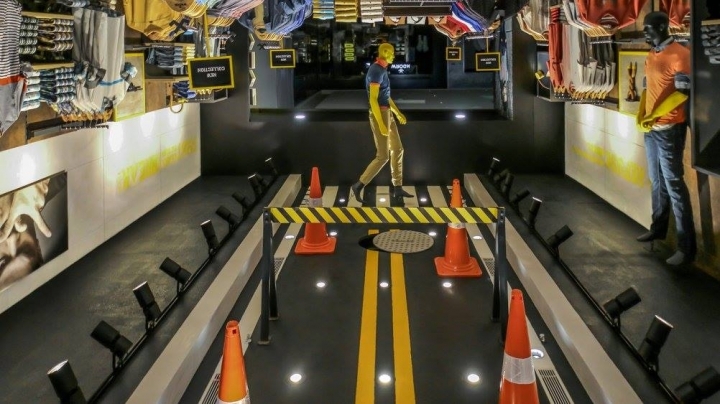 The vehicle, found abandoned and damaged, had to be disassembled, cut, cleaned and painted before it was added on-site. 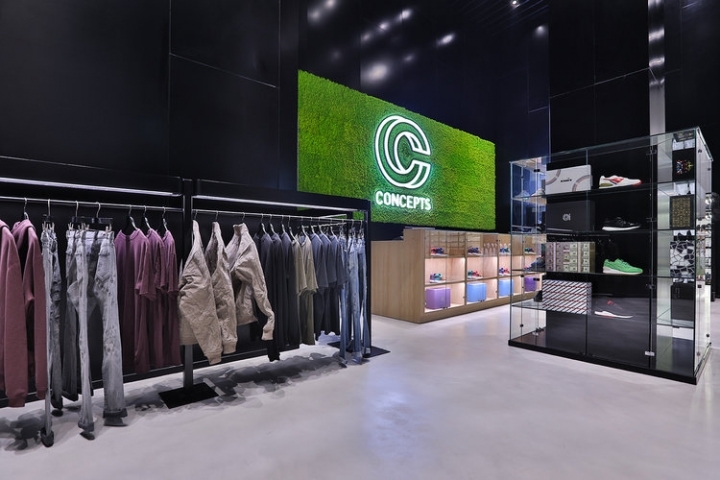 Stylistically, the store’s eccentric features were a clear match for the brand, but they were also meant to make shoppers stop and take notice. 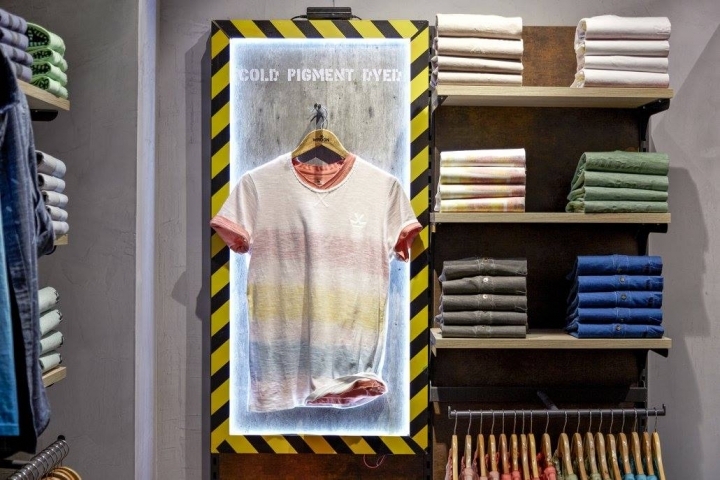 “[Young people today are] now used to being ‘entertained’ all the time … In that context, we have got to get his attention, stage the brand, showcase the merchandise and help him buy,” Chiorino says. 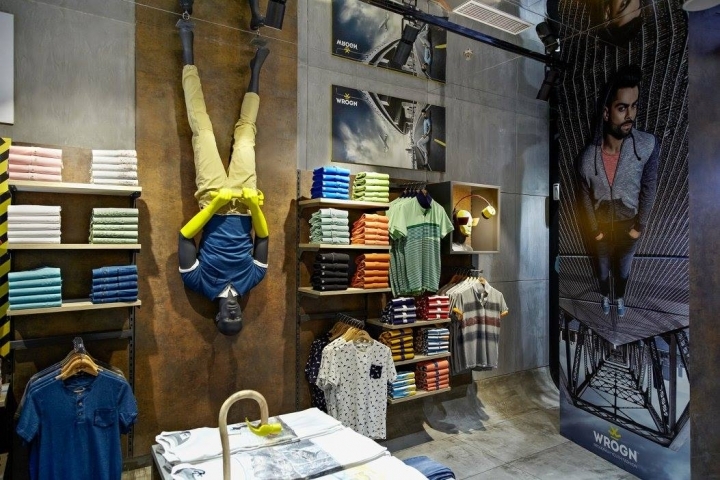 The stores’ feature displays – depicting upside-down mannequins, one crossing a “street” on the ceiling – draw shoppers inside. 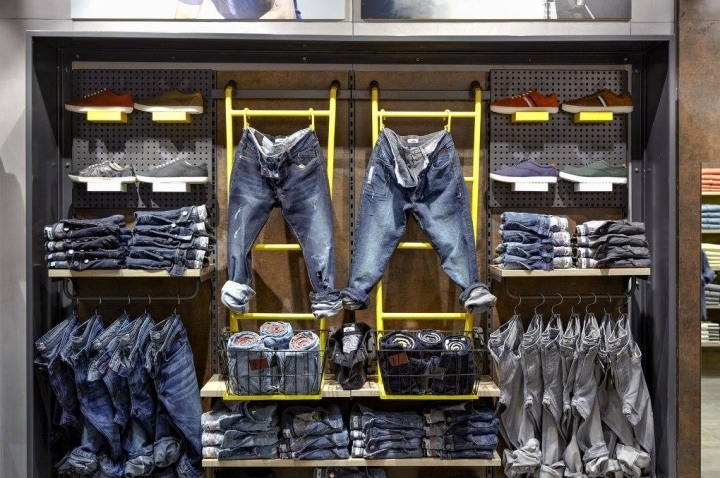 Once they’ve entered, the customer journey aids in the shopping process, something Chiorino suggests is crucial in menswear. 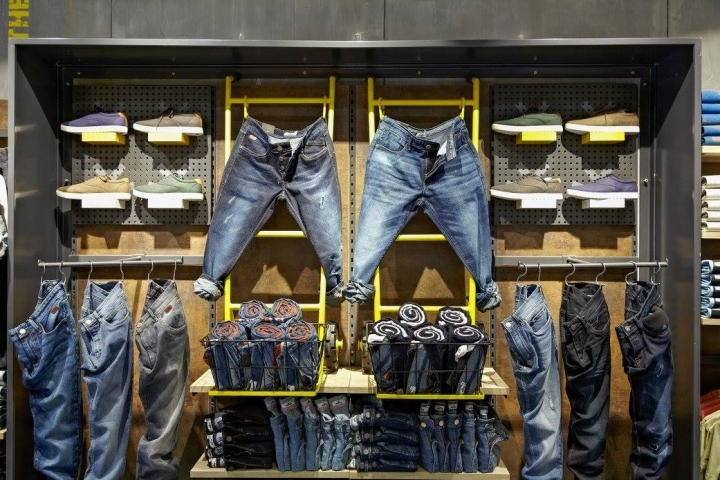 New and featured items are highlighted at the entrance, and denim and accessories are displayed along facing walls to pull shoppers to the back of the store. 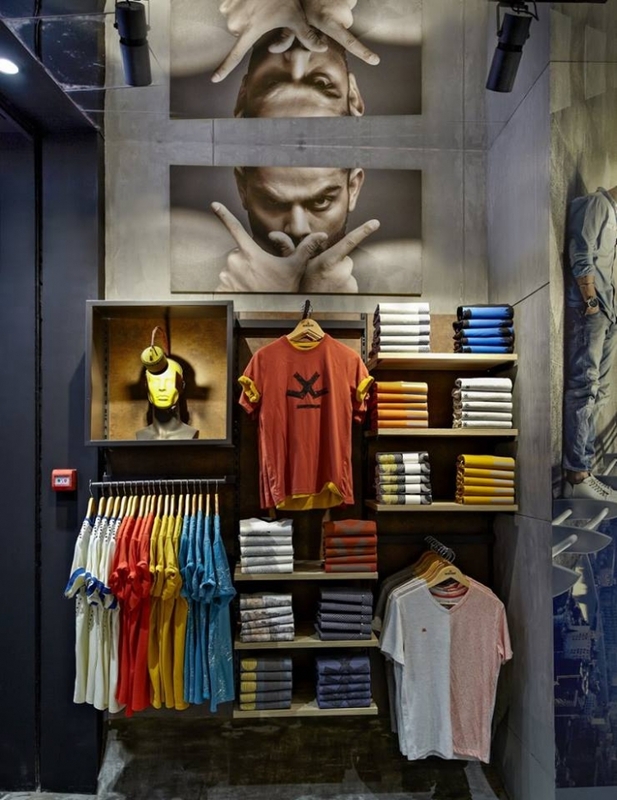 The brand’s ambassador, cricket player Virat Kohli – an instantly recognizable celebrity in India – is featured prominently on signage throughout the store and acts as a style influencer. 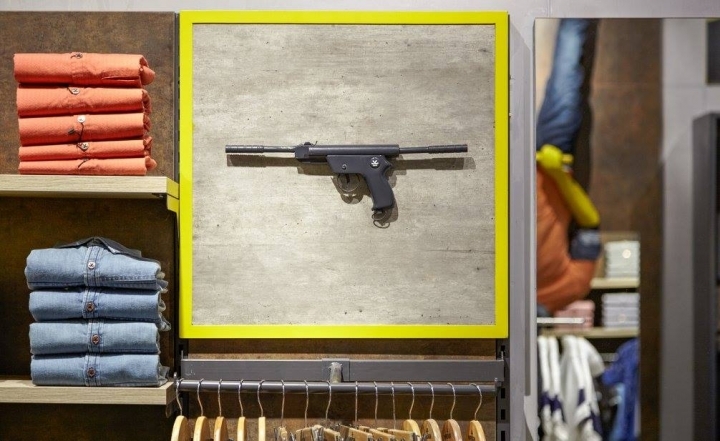 Similarly, fixtures are merchandised with complementary pieces, helping shoppers match items to create a complete look, lowering the intimidation factor. 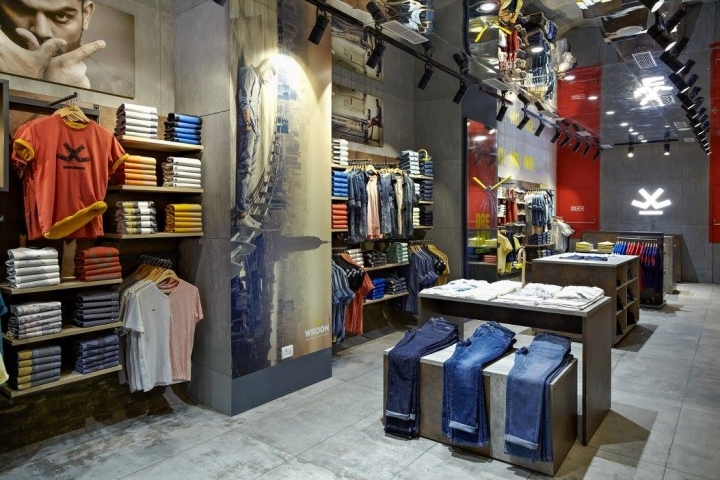 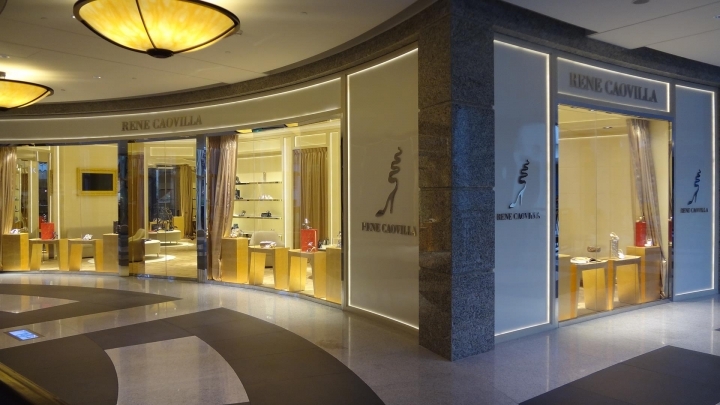 While the two stores possess a synonymous atmosphere and comparable dimensions, it was important to the designers to include some differences, which were subtly achieved using an alternate color scheme and varying props.